A photo of Margie and Haze, her beloved horse, inspired me to change the direction of the book that became, The Breath of Horse Crazy – The Love Affair Between Women and Horses. It spoke to the love of horses we share in a visual way that rises above every language but the heart. When you’re the youngest in the family, when you feel excluded from life in general, basically not fitting in anywhere – home or school, socially you withdraw. I grew up not feeling good enough at anything. I mostly wanted to be overlooked so I wouldn’t be picked on (name calling, #kids can be so cruel). I remember always wanting to be called first to be on a team in gym; I was usually picked last. I changed schools multiple times because our family moved so often, but always in northwest Ohio. I saw it as a way to change who I was, to be a newer better “me”. The question was – who am I though. Really who was I? Books were my salvation. The stories took me away into the world of horses! The girl and the horse. Galloping along in my mind along with the long car rides to church. Jumping fences, ditches, streams and I was free and happy. I feel like God put this desire on my heart to give me a goal, a desire for something almost out of reach. How was I going to get there? God worked in my life through people reaching out, allowing me to ride their ponies, to sit along a fence and just watch them graze. There was that magical moment a horse would come to me and allow me to stroke its beautiful face! If not for God’s love, where would I be now? He put the desire on my heart but I had to work to get it filled. I found a way to go to college, got a job, found my best friend and now husband Jim, and we bought Haze. God knows what will drive us forward and not downward. For me it was and is horses! They are my angels that lift me up. I have learned about faith, trust, stewardship and hard work, putting in the effort and not easily being given anything. The horse is not a push-button experience and neither is a relationship with God. There is no easy path – just one path. The path for each of us will be tough enough to strengthen us, not to break us. We are not here to break a horse nor is God here to break us. He wants us to desperately and fully love and trust him. Seems the same things I wanted from Haze. The number of times I had left the barn crying because I thought Haze hated me. Seems so funny now. God has filled me and and continues to try and teach me through horses. Jim and I may not have our sweet Haze anymore, but I still ride and take lessons. I feel like I am starting riding all over again because these horses are so different and again, not a push-button experience. Why can’t it ever be easy and we just start doing all the wonderful upper level dressage moves? Why do I have to keep figuring out the forward trot and the canter depart? Why do I still cry in frustration over this struggle? Because every day I am faced with a choice; to stop, or go on. I can’t stop loving horses, or stop photographing this beautiful animal to share with others. I want so much for women to know we are enough as we are for God. We are being made strong through our struggles, we are never too old to keep learning. We can’t ignore God, we need to embrace God’s will in our life, trust him enough to start over every day, to be lifted up, to be strengthened and to be fully loved by God. I know who I am; a daughter of God adopted in, grafted to this Savior, Jesus Christ my Lord. The breath of life is in me and I feel it in the breath of the horse on my face. I hope you enjoy the images of Haze. If you go to my website https://margieshoop.smugmug.com/ or my Facebook page https://www.facebook.com/MargieShoopEquestrianPhotography/ I hope you’ll see the love and beauty of this magnificent animal. It’s so odd, the path of my life. I have a B.A. in Fine Arts, an MBA in Organizational Leadership and a Masters Certificate in IT Project Management. The technical and the artist. I currently work as an PM in IT at Marathon Petroleum. God has blessed every step. 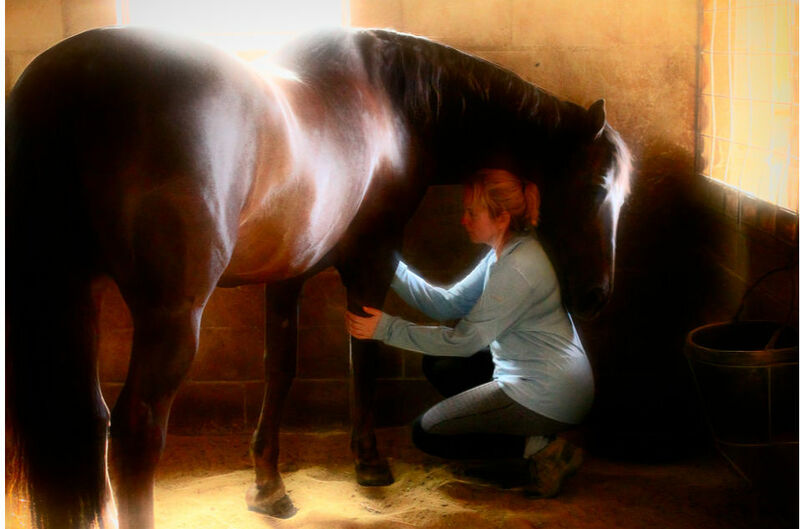 I ride at KB Equestrian LLC, with a trainer young enough to be my daughter – Katherine Byrd. Another blessing God has brought into my life. Photographs on this page are the copyrighted works of Margie Shoop, used with her permission. Meet the other amazing and generous women who shared their horse-crazy dreams here: The Ladies of the Breath of Horse Crazy.